I recently had the pleasure to sit down at my desk with phone in hand and have an informative, fun, and freewheeling conversation with puppeteer Terry Angus. 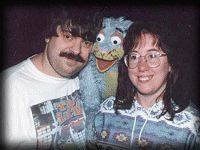 Those of you out there familiar with the online Muppet community know him, but for those who dont, Terry was a puppeteer for the run of the venerable classic, Fraggle Rock. He performed such characters as Storyteller Fraggle, Brio the Minstrel, and background character, Morris Fraggle. Just part of the family... Terry and Cheryl Angus are joined by Butch G. Cat, one of Terry's many creations. While associated with the Henson Company, he also was a performer in such specials as The Christmas Toy, The Fantastic Miss Piggy Show, Muppet Family Christmas, and The Muppets: A Celebration of 30 Years. After leaving the Henson Company, he went on to help create the CBC series "Blizzard Island," and the irrepressible Butch G. Cat. He is currently working on a new production called "Four Fish Fly Free," whose videos will be in stores in time for Christmas.